Another fight in Smoke and Mirrors nightclub, the same nightclub where she allegedly pushed a woman 2 weeks ago, and got into it with another woman. Haha, it ended with LiLo on the receiving end of a flying drink. So how went it down? 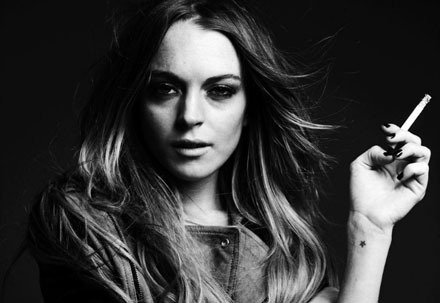 Lindsay’s friend drove her car to the hotel – LiLo was in the passenger seat. The driver pulled into the parking garage and hit another car. Witnesses say Lindsay then called her dad, Michael, for help, and he dutifully showed up. And what did he do? He took Lindsay inside the club and the two hung out for hours … Geez! Wtf do you end up with so much drama by just going to a club, without even drinking ? Her friend had an accident just parking the car and then they dragged that lunatic father of hers into this ? Why would she go there if she was trying to stay out of trouble and she knows people there have it out for her? Is she trying to get her own reality TV show ? Around closing time, a woman in the booth next to theirs made a snide comment about Lindsay showing up with her dad. Lindsay then got up and screamed at the woman, “Shut the f**k up.” They said that’s when the drink drenched the actress.Then Michael grabbed his daughter and made a beeline for the door. Okay, so it’s now official: Lindsay Lohan is so addicted to any attention, good, bad, or ugly, that she’ll risk her life and freedom in order to get it. Hopeless. Demi Moore is Chasing After Young Hollywood Actors! Charlize Theron kisses for money!